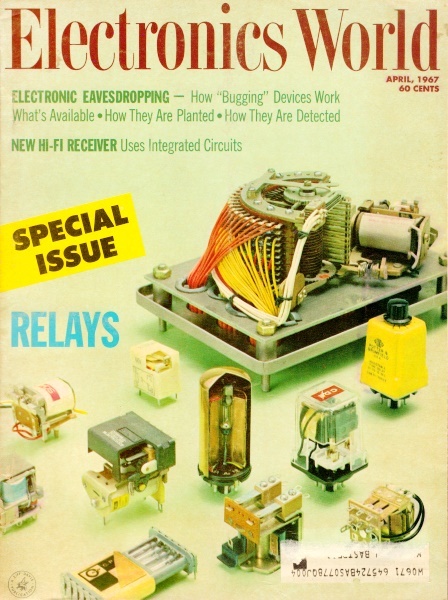 The April 1967 edition of Electronics World had a series of articles on designing systems with electromechanical relays. Even in today's high solid state relay world, there are still lots of applications for electromechnical relays. Only a handful of people actually design them, but the application tutorials provided therein are as valuable to today's engineers and technicians as they were 45 years ago. Since graduating from the engineering school at the University of Kentucky in 1937, the author has held supervisory positions in just about every production and engineering department at Guardian Electric. From 1960 to 1963 he served as Chief Design Engineer and has been Assistant Chief Engineer since 1963. He is a Registered Professional Engineer and holds many patents on relay, switch, and stepper designs. By Warren Wright / Asst. Chief Engineer, Guardian Electric Mfg. Co.
Definitions of these important characteristics and methods that are used to modify these parameters. Since graduating from the engineering school at the University of Kentucky in 1937, the author has held supervisory positions in just about every production and engineering department at Guardian Electric. 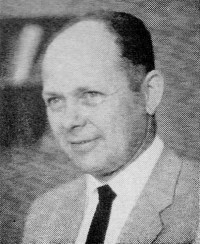 From 1960 to 1963 he served as Chief Design Engineer and has been Assistant Chief Engineer since 1963. He is a Registered Professional Engineer and holds many patents on relay, switch, and stepper designs.All too often relays are placed in control and logic circuitry without enough consideration being given as to whether or not the relay operational time characteristics will assure proper functioning of the circuit under various operating conditions. A working knowledge of which factors affect relay operating time can give the circuit engineer or technician confidence in his design. In general, relays are electromechanically operated switches, thus there are two items which must be evaluated when considering the time elements of relay function. These are the electrical characteristics and the mechanical characteristics. But first, let's define the terms and then consider their relationship to total relay function. The operate time of a relay is the time interval from the instant of coil-power application until completion of the last contact function. The release time is the time interval from the instant of coil-power cut-off until the completion of the last contact function. (See Fig 1.) Note that the operate and release times do not include contact-bounce times. When coil power is applied, coil energizing current increases until the magnetic flux is sufficient to move the relay armature and its contact-actuating members. Upon removal of the coil power, magnetic flux does not collapse instantly, but decreases for some period of time - depending on the circuit, the coil, and the magnetic structure. When the magnetic flux drops below the "hold-in" value for the particular relay, the armature and its contact-actuating members return to the normal or de-energized position. With these fundamental characteristics in mind, we can now consider the various relay designs and the effect of circuit characteristics on operate and release times. For d.c. relays, the operate time of a specific relay design may be reduced by three methods. First, we can overdrive the relay. This is done by increasing the control voltage, decreasing the coil resistance, increasing the control voltage and adding a series resistance, discharging a capacitor at an over-voltage charge into the coil, pre-energizing at some value below pickup voltage (the lowest voltage at which the relay always operates), using dual-wound coils - one coil for overdrive, the other to hold the armature in the operated position, using a series resistor shunted by a capacitor, using a positive temperature coefficient resistor in series with the coil, and using a series resistor shunted by an N.C. switch - the switch being operated by the relay being controlled. Second, we can reduce the pickup voltage of the relay by mechanical means, such as by reducing return spring pres­sure, reducing the armature gap, or reducing contact pressures and gaps. Third, we can decrease the mechanical inertia by reducing the mass of the moving elements such as contacts, armature, and contact actuators. For d.c. relays, the inherent release time of a specific de­sign may be increased by using a parallel capacitor and series resistor, a parallel shunt resistor or switch, parallel diode, or by reducing the residual magnetic air gap. Relay manufacturers produce many varieties of relays with operate and release times ranging from minimal values of less than one millisecond to some of the more exotic solid-state relays with maximum times of 30 minutes or more. When specific time characteristics are needed, the relay manufacturer can usually provide relays to match the circuit requirements either from "standard" relays or as "specials" designed for a specific function. The National Association of Relay Manufacturers (NARM) has not set standards with respect to fast or slow response. In general, relays which have operate and release times under 3 milliseconds are considered fast-operate and/or fast-release. Relays with function times of 50 milliseconds or more are usually considered slow-operate or slow-release. Relays with function times between 3 and 50 milliseconds are medium-operate and release and this is the range into which most general-purpose relays fall. Relays which are purposely designed for slow function time are classified as time-delay relays. These are covered in another article in this special section. Relay manufacturers produce a bewildering range of relays for use in over a hundred "usage" classifications, with thousands of varieties and modifications in each classification. It is obviously impractical to analyze all of these types, therefore we will only cover some of the most popular general-purpose relays. The graphs of Figs. 2 and 3 show the effects of ambient temperature changes on the attract and release times of some typical general-purpose, d.c.-powered relays. 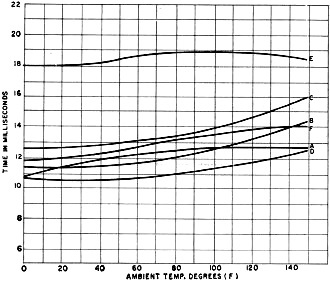 From this we can see that the attract or operate time increases with temperature and the release time decreases with temperature rise (although circuit components may modify this). When we consider that relays heat up either under ex­tended energization or repeated cycling, we can expect a relative shift in operating time characteristics, depending upon the frequency of operation. Fig. 1. Typical d.c. operation of a relay with a resistive d.c. load. Relays from different manufacturers, but of the same type, generally have similar operating-time characteristics. It will be noted that some relay types change more with temperature than others - this is inherent in the design of the relay but. in general, the time change is within ±10% over an ambient temperature range of 0°F to 160°F. Other factors affect timing, such as changes in operating voltage or current. in which the attract time varies inversely with coil power and the release time varies directly with coil power. Where operation time is critical, the relay should be evaluated in the circuit under the most adverse combination of variables. Power-supply inductance will increase the operate time of d.c, relays depending upon the L/C ratio of the circuit. Resistance in the power-supply line will tend to decrease the operate time. Relays which are wired in parallel would aggravate these effects. Arc suppressors or coil shunts will increase the release time of relays. Basically, d.c. relays are reasonably consistent in their timing characteristics under the same operating conditions, but this is not the case with a.c. relays. Other variations in both attract and release times are due to the added factor of the instantaneous (turn-on or turn-off) voltage change. The source voltage varies from zero to peak 120 times per second, thus any voltage from zero to peak may be applied across the coil at the instant of either "turn-on" or "turn-off". Examination of a typical 60-Hz sine wave will show that most of the time the instantaneous voltage at "turn-on" or "turn-off" will be higher than the pickup voltage of the relay, so that the time characteristics are usually within a reasonable range. Frequently, however, the probability of turning on or off at lesser voltages catches up with us and the operating time suddenly changes. This voltage variation is further complicated by the magnetic flux distribution between two or more functional pole faces. Remember that a.c. relays generally have one core face shaded by a copper ring to cause a phase displacement in the magnetic flux. 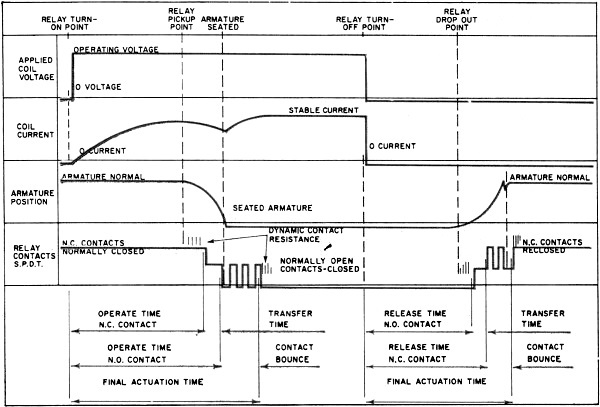 This phase shift is necessary to provide relay hold-in during current reversal. Thus, we have an operational time range rather than a specific operation time. 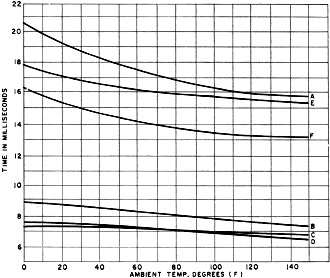 The manufacturer generally specifies the average function time for a.c. relays. Fig. 2. Variations in operate or attract times at various ambient temperatures for six general-purpose d.c. relays. Fig. 3. Variations in the release times at various ambient temperatures for the same six general-purpose d.c. relays. 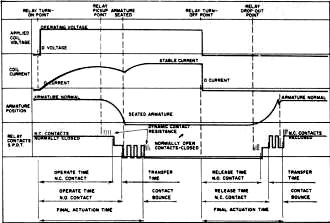 Modification of operational time for a.c. relays may be accomplished in a manner similar to that for d.c. relays, but the actual time of operation will vary because of the sine-wave voltage applied. We must conclude, therefore, that straight a.c. relays should not be used in circuits where precise repeatable narrow-range operational times are required. The mechanical characteristics which affect operational time apply to both d.c. and a.c. relays and what affects one type will usually affect the other type in the same manner. Increases in mass, whether it be in contact actuators, the contacts, or armature will slow the operational time. Release time will be increased by minor contact welding or sticking, mechanical wear, and residual magnetism. We have not attempted to give charts showing precise operating characteristics of relays because the timing is subject to so many variables from relay to relay type, depending upon adjustment, type and number of contacts, voltage variation, source impedance, line resistance, wear factors, etc. Information on timing characteristics is available from the manufacturer and should be used whenever operate and release timing is critical.